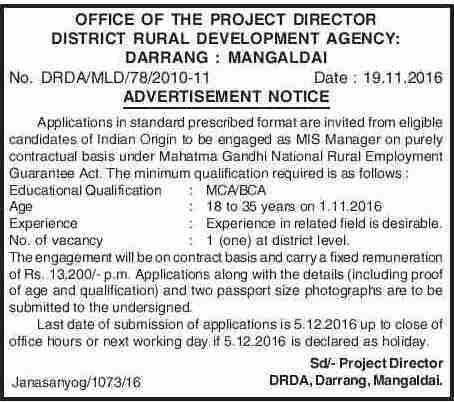 District Rural Development Agency, Darrang. Applications in Standard prescribed format are invited from eligible candidates of Indian origin to be engaged as MIS Manager on purely contract basis under MGNREGA. Age: 18 to 35 as on 01-11-2016. How to apply: Applications along with details and two copies of passport sized photographs must be submitted to the following address: Project Director, District Rural Development Agency, Darrang, Mangaldai.